It may have 'science' in the title, but each exhibition at the gallery proves it to be the most creative, innovative and artistic venue in Ireland. In 2008, a forgotten corner of Trinity College Dublin was transformed into a living experiment called Science Gallery. Through a cutting-edge programme that ignites creativity and discovery where science and art collide, Science Gallery Dublin encourages young people to learn through their interests. Since opening in 2008, nearly three million visitors to the gallery have experienced more than forty unique exhibitions ranging from living art experiments to materials science and from the future of the human race to the future of play. Science Gallery Dublin develops an ever-changing programme of exhibitions and events fuelled by the expertise of scientists, researchers, students, artists, designers, inventors, creative thinkers and entrepreneurs. The focus is on providing programmes and experiences that allow visitors to participate, facilitate social connections and provide an element of surprise. Science Gallery at Trinity College Dublin is kindly supported by the Wellcome Trust as founding partner, and by ‘Science Circle’ members Deloitte, ESB, Google, ICON and NTR Foundation. 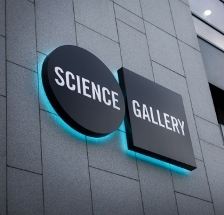 Science Gallery Dublin receives support from programme partners Bank of Ireland, Intel Ireland, The Ireland Funds, Pfizer, Walls to Workstations and The Marker Hotel. It also receives government support from the Department of Arts, Heritage and Gaeltacht and Science Foundation Ireland alongside European Commission funding instruments. Science Gallery Dublin’s media partner is The Irish Times. Science Gallery is also part of the growing Global Science Gallery Network pioneered by Trinity College Dublin with new galleries and projects soon to open in Bengaluru, Detroit, London, Melbourne and Venice. For more information on Science Gallery Dublin visit: dublin.sciencegallery.com. See our latest videos here. If you are interested in learning more please contact Sarah Williams, Development Manager, on +353 1 896 4541.